Welcome to Ismini Phillips Studios, your local Pilates studio in Tonbridge. We are a group of experienced Pilates teachers offering Pilates classes for people with all levels of experience, so whether you are completely new to the practice or have years of experience, you will find a class to suit you. We also offer Pilates for rehabilitation and healthcare, providing support for mums-to-be, people with breast cancer, people with neurological conditions, and those suffering from back pain. In addition, we offer a range of general fitness classes for all levels. If you want to keep fit and improve your overall health, why not join us for a Latin Vibes or bootybarre class? Pilates is a great workout for the body and it helps relax the mind as well. Why not join us for a class? 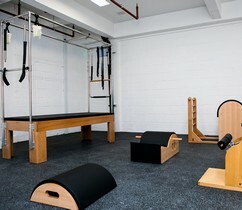 Modern Pilates studios We have three state-of-the-art studios with specialist equipment for all classes. Relaxing café area We take a holistic approach to wellbeing – pop into our cafe to enjoy a healthy treat. Treatment room Enjoy complementary therapies like sports massages and reflexology in our treatment room. Specialist Pilates We offer Pilates for breast cancer rehabilitation, neurological conditions and back pain relief. Classes for all levels From beginners through to advanced students, we’ve got the right class for you. Pilates classes for all levels, including a range of practices from arc barrel Pilates to HIIT sessions. Everyone can enjoy our Latin Vibes classes. Dance your way to fitness in a fun, friendly environment. Want to try something a little different? bootybarre combines dance, Pilates and yoga to create an intense workout experience for the whole body. A system used to reorganise and re-educate yourself and form new connections within your nervous system, improving movement and reducing pain. Take a break from work with a relaxing, invigorating team-building Pilates or Feldenkrais session. Not sure if Pilates is for you? There’s some good news – it can benefit everyone. I went to ante and postnatal Pilates both throughout my pregnancy and then after I had my baby. It kept me focused, alleviated any backache and helped me to get my core strength back after having the baby. Ismini has a thorough and safe approach and keeps an eye on you throughout. Meet the lady who founded our Pilates studios – her inspirational work has helped so many people in and around Tonbridge to gain strength, confidence and relaxation through tailored exercise programmes. See when each of our classes is running and get booked in.